Astronomers have found the first clear evidence of a binary quasar within a pair of actively merging galaxies. Quasars are the extremely bright centers of galaxies surrounding super-massive black holes, and binary quasars are pairs of quasars bound together by gravity. Binary quasars, like other quasars, are thought to be the product of galaxy mergers. Until now, however, binary quasars have not been seen in galaxies that are unambiguously in the act of merging. But images of a new binary quasar from the Carnegie Institution's Magellan telescope in Chile show two distinct galaxies with "tails" produced by tidal forces from their mutual gravitational attraction. "This is really the first case in which you see two separate galaxies, both with quasars, that are clearly interacting," says Carnegie astronomer John Mulchaey who made observations crucial to understanding the galaxy merger. Most, if not all, large galaxies, such as our galaxy the Milky Way, host super-massive black holes at their centers. Because galaxies regularly interact and merge, astronomers have assumed that binary super-massive black holes have been common in the Universe, especially during its early history. Black holes can only be detected as quasars when they are actively accreting matter, a process that releases vast amounts of energy. A leading theory is that galaxy mergers trigger accretion, creating quasars in both galaxies. Because most of such mergers would have happened in the distant past, binary quasars and their associated galaxies are very far away and therefore difficult for most telescopes to resolve. The binary quasar, labeled SDSS J1254+0846, was initially detected by the Sloan Digital Sky Survey, a large scale astronomical survey of galaxies and over 120,000 quasars. 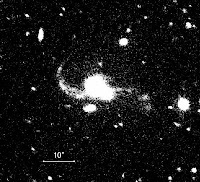 Further observations by Paul Green of the Harvard-Smithsonian Center for Astrophysics and colleagues using NASA's Chandra's X-ray Observatory and telescopes at Kitt Peak National Observatory in Arizona and Palomar Observatory in California indicated that the object was likely a binary quasar in the midst of a galaxy merger. Carnegie's Mulchaey then used the 6.5 meter Baade-Magellan telescope at the Las Campanas observatory in Chile to obtain deeper images and more detailed spectroscopy of the merging galaxies. "Just because you see two galaxies that are close to each other in the sky doesn't mean they are merging," says Mulchaey. "But from the Magellan images we can actually see tidal tails, one from each galaxy, which suggests that the galaxies are in fact interacting and are in the process of merging." Thomas Cox, now a fellow at the Carnegie Observatories, corroborated this conclusion using computer simulations of the merging galaxies. When Cox's model galaxies merged, they showed features remarkably similar to what Mulchaey observed in the Magellan images. "The model verifies the merger origin for this binary quasar system," he says. "It also hints that this kind of galaxy interaction is a key component of the growth of black holes and production of quasars throughout our universe."